4 Bedroom Terraced House For Sale in London for Asking Price £2,300,000. 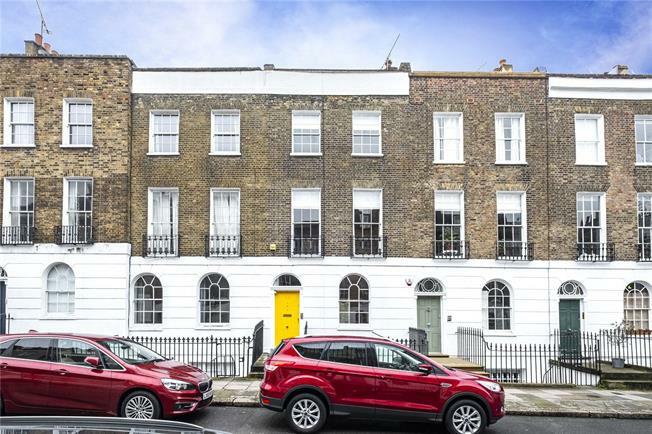 A fabulous opportunity to acquire a substantial Grade II Listed Georgian four storey family house, on one of Islington’s premier roads. This beautiful property has been excellently styled, and has many period features, including original fireplaces, restored ceiling cornices, sash windows and original folding shutters. There is an elegant double reception room on the raised ground floor with oak flooring and custom built cabinets. Additionally on this level is a bathroom. On the lower ground floor, a large family kitchen and further reception room leads into an extended area, which would be ideal for either a play area or study, creates a perfect space for entertaining and family living. On the first floor the master bedroom has two stunning floor to ceiling sash windows and period fireplace next to an additional bedroom and the family bathroom. The second floor houses two further bedrooms and a bathroom. The secluded rear garden has newly laid faux lawn with an in-built seating area and raised flower beds. Noel Road is a much sought after quiet residential street situated within the Duncan Terrace/ Colebrooke Row Conservation area. The nearest underground station is Angel (Northern line), within 0.2 miles, providing excellent transport connections to the City, West End, Canary Wharf and King's Cross/St Pancras. The property is within easy reach of all the amenities of Upper Street with its superb array of shops, bars and restaurants. It is also located within close proximity to Regents Canal.